In February, Hollywood’s finest will gather in Hollywood for the film industry’s most important event: the Academy Awards, and the Best Picture winner will be subject of countless debates. Ninety years ago this spring, the first Best Picture award went to Wings, a World War I-centered silent film released in 1927. Wings may have only been up against two other films for the top prize, but it was a film that had dominated the box office and captivated audiences across the nation for nearly two years and stoked public enthusiasm for the still growing field of aeronautics: it was a clear winner. In 1927, after Charles Lindbergh’s successful transatlantic flight between New York and Paris, the world was captivated by aviation and the daring exploits of the pilots who took to the skies. In August that year, Wings was released to critical and public acclaim, and set a precedent for technical accuracy in the many aviation films that followed. Starring famed silent film stars Clara Bow, Richard Arlen and Charles “Buddy” Rogers, the film focused on two American men who volunteer for service after the outbreak of the Great War and how their experience in the war changes them from rivals fighting over the affections of a local girl, to best friends who are tragically separated after a deadly aerial battle and a case of mistaken identity. Filmed just eight years after the end of the war, Wings aimed to capture realistic aerial battles and crashes, the likes which had yet to be successfully captured on film. The film was directed by William A. Wellman, a young newcomer in Hollywood, who had limited prior experience but had himself been an aviator in the war, serving with France’s 87thAero Squadron and was credited with two confirmed aerial victories. In order to obtain the necessary aircraft, military equipment, and more importantly, the skilled military pilots needed to carry out the intricate aerial battles Wellman envisioned, the U.S. War department advocated that the film be shot in San Antonio, Texas and utilize nearby Kelly and Brooks Fields and their personnel. 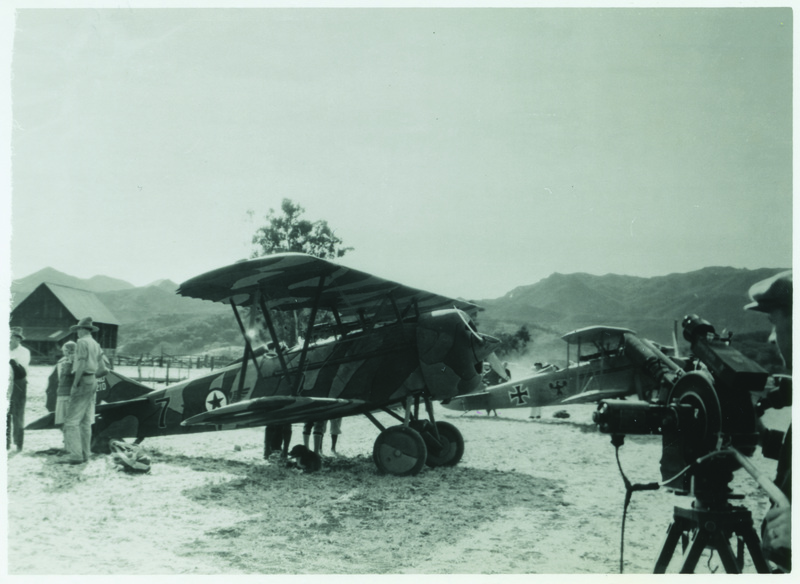 The film was shot over the course of nine months using nearly 300 pilots, and actual war veterans, along with Boeing-built Thomas-Morse MB-3s and Curtiss P-1s painted in French and German markings. Wings also featured other aircraft available at Kelly Field, including Curtiss JN-4 Jennys, De Havilland D.H-4s, and SPAD VIIs. One of its most incredible scenes involved a massive re-creation of the St. Mihiel battlefield, in which Wellman coordinated a ground battle with 3,500 local troops, with over 150 planes swooping overhead and a number of impressive coordinated explosions. Wings was an instant success, with the public and aviators alike dazzled by the realistic aerial combat and the heartbreaking story of friendship and love during the war. Ninety years ago, the Academy of Motion Picture Arts and Sciences hosted its inaugural award ceremony on May 26, 1929 at the Hotel Roosevelt in Hollywood to honor films released in 1927 and 1928. Far from the lavish, 3-hour ceremony filled with dozens of awards, questionable comedy bits, Broadway-style musical performances, and the inevitable orchestra music cutting winners’ acceptance speeches short that we have come to know today, the first ceremony was a seated dinner which Hollywood’s elite purchased $5 tickets to attend and included a brief 15-minute presentation to hand out just 12 awards. There was no ceremonial opening of the envelope: the winners had already been announced three weeks prior. Silent film star Douglas Fairbanks presented the Best Picture statue to Clara Bow, then such a box office draw, that much of the movie’s script had been re-written simply to accommodate her role. It was the first - and only - silent film to receive the Best Picture award, until the mostly silent French film The Artist won in 2012. 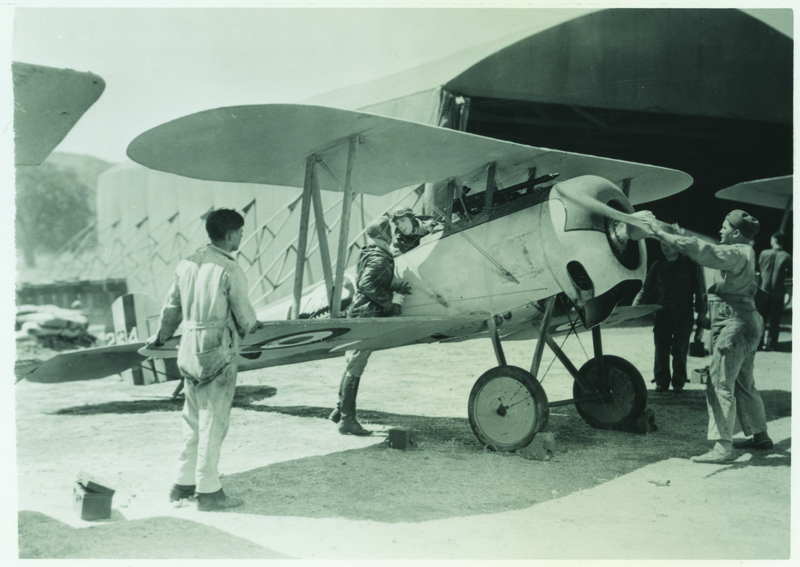 Want to learn more about WWI aircraft? Check out our J. Elroy McCaw Personal Courage Wing! *This article was originally published in Aloft Jan/Feb 2019 issue.